Our 3,000 sq ft workshop is designed for ease of workflow, production and assembly. 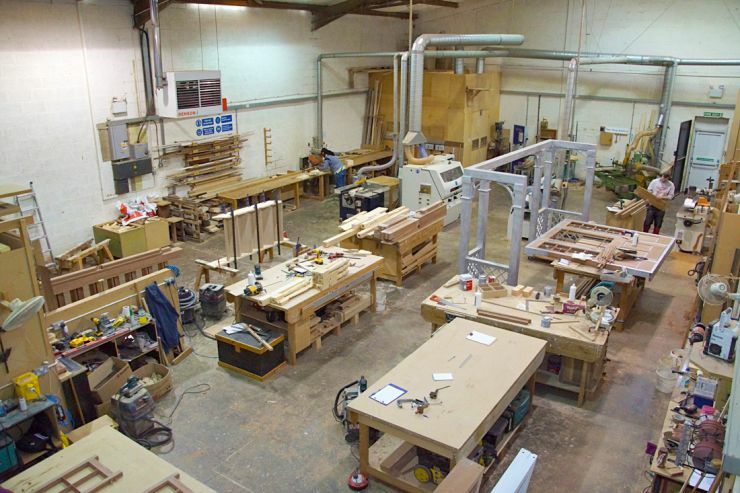 Using modern machinery and power tools, including saws; a four-sided planer; a morticer, tennoner, and spindle moulder; routers and sanders, our qualified joiners have the equipment necessary to produce each piece of joinery work to a very high standard. All machines are fully extracted into a central dust collection unit to manage the quality of the air in the workshop. As is customary within the purpose-made joinery industry, employees use their own personal hand tools, chisels, saws and hammers. Responsibility for maintaining hand tools in good condition lies, therefore, with their owner. Not only does this ensure that every job is completed to the highest quality standards, in which a sense of pride is evident, but it also provides an element of individuality and sense of pride in each piece of joinery produced.